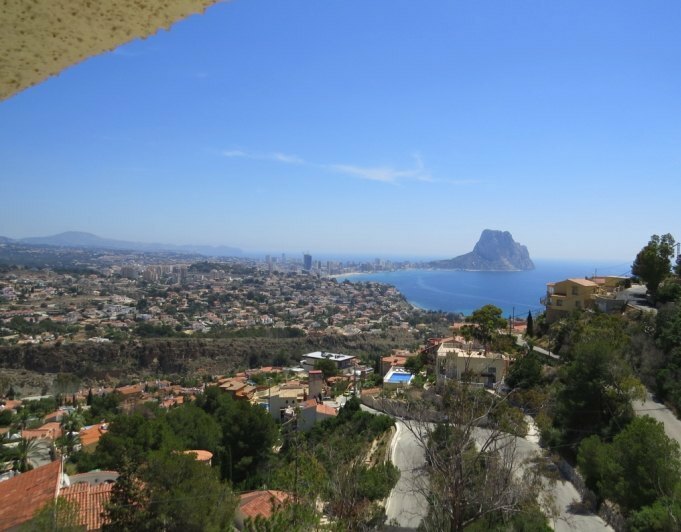 In the urbanization of Cometa in Calpe, this south facing villa is located only a few kilometers from the town centre and has great views of the Peñon de Ifach.The villa consists of 2 living areas. On the upper floor there is the main residence which has a living room + naya with a fireplace and lovely separate kitchen of 20 m2 with island which connects with an outdoor terrace of 25 m2. There are 3 bedrooms, the master bedroom is large and it opens up to 15 m2 private terrace, the other 2 bedrooms are 9 m2 and there are 2 bathrooms (1 with shower and 1 with a bath). There is gas central heating.On the ground floor there is an apartment with 2 bedrooms, 1 bathroom with shower, kitchen and lounge with access to several terraces and the pool with outside shower + toilet. The garden is full of beautiful plants and trees and there is a summer to kitchen to enjoy outdoor life. On the roof of the villa there is a large solarium where the views are fabulous.The villa also has a carport and a garage. This is a lovely property at a very realistic price and is worthy of viewing. 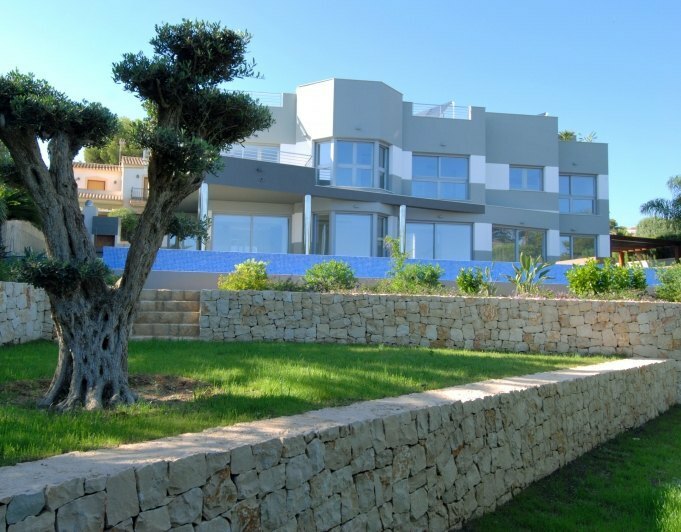 4 +1 bedroom Villa for sale in Calpe Maryvilla with panoramic seaviews. PRICE REDUCED FROM 550.000€ TO 420,000This Villa has panoramic sea views and a separate guest apartment with 1 bedroom, kitchen and bathroom. The Villa is build in 1984 and renovated in 2010, build size 250 m2 and plotsize 970 m2 and has an elevator. The Villa has 3 levels and the main bedrooms are found on the first floor and the main living area is on the top level. Each level has fantastic panoramic sea and country views. 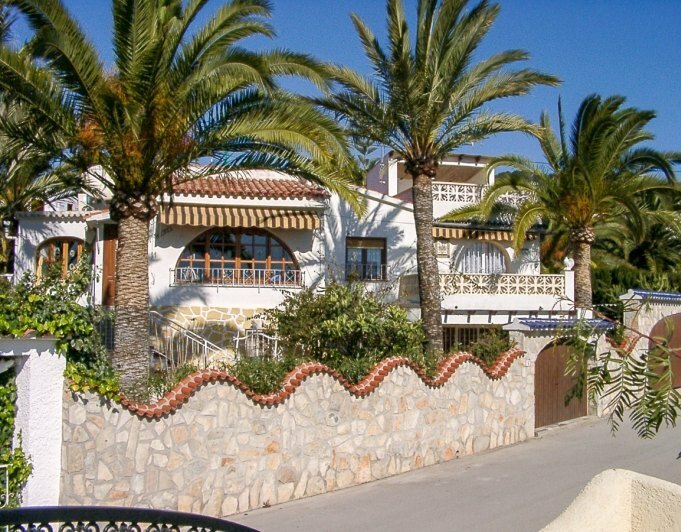 This Villa was rated as number one holiday property on many holiday home booking webpages. This Villa is perfect for a family and holiday home.Extras: pool and jacuzzi, doble glazed, the plot is fenced, open terrace and a Naya, elevator and Air Conditioning. Six bedroom villa for sale CalpeVery nice villa in a quiet location with stunning views and sunsets. The villa is in a very good location, and is ideal for permanent living with very good rental potential as well. The villa comes with air with central and heating is in very good condition and ready to move into.There is a very nice pool and BBQ area and parking for 3 cars. 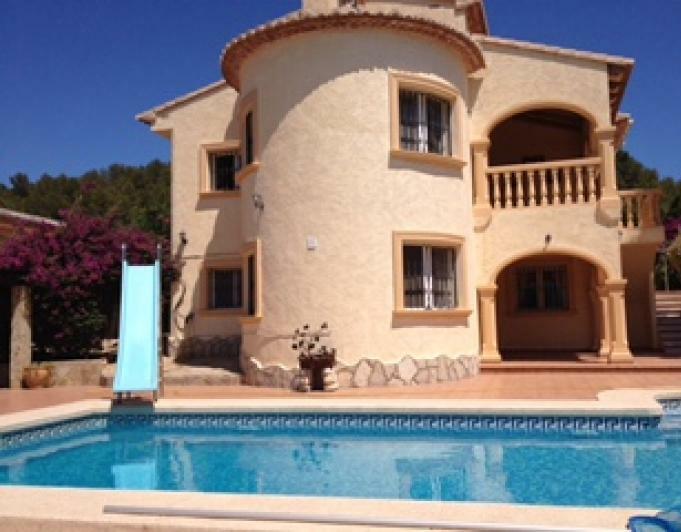 This is a fantastic villa that has been recently reformed to a very high standard, set on a 1000m2 plot located in Calpe, just a short drive to all amenities. Entrance to the property is via electric sliding gates entering an ample driveway where we can find the garage and main entrance to the villa. The villa is distributed all on one level and comprises of three double bedrooms, two bathrooms a lounge/dining area with a fully equipped open plan kitchen. Throughout the property there is ducted air conditioning. Outside there are variou terrace areas, an outside kitchen, a utility room with a toilet and an 4x8 swimming pool.Extras include:Independent garage.Outdoor parking paved with natural stone.Separate laundry room with toilet.Solarium.Heating and air conditioning ducts with heat pump.Granite countertopBathrooms with glass screen in shower and washbasin cabinet.Solar hot water plus accumulator with electric 150 l.4 x 8 pool with paved terrace 150 m2 with heat pumpOutdoor shower with hot waterArmored entrance door.Interior carpentry in white lacquered wood.Completely finished garden, part with antiweed mesh and red Alicante gravel, with programmable drip installed.Fully fenced plot with access doors with automatic door entry and remote control.Porcelain stoneware tiles.Alarm. 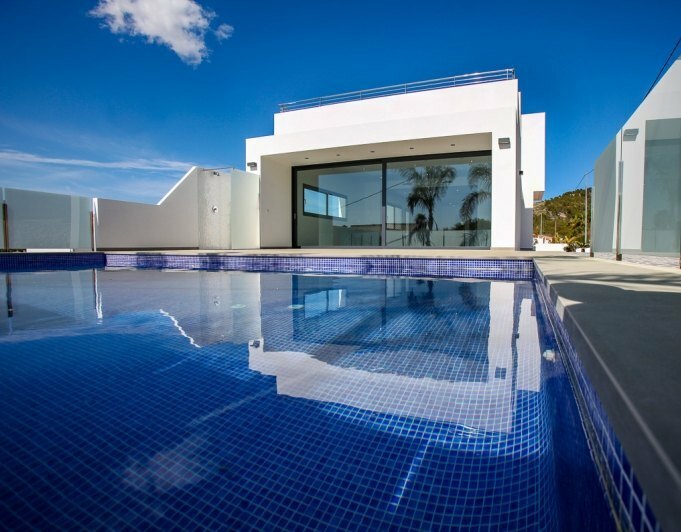 New construction located in the Tossals urbanization in Calpe.Modern style villa built in 2019 with three bedrooms, two bathrooms, an open fully equipped kitchen with Bosch appliances, a spacious livingdining room and a garage in the basement.Extras include:Underfloor heatingAir conditioning with heat pumpRefrigerator, ceramic induction hob, dishwasher, hoodExtractor, oven and washing machine.Granite countertopLighting with led.Bathrooms with glass screen in shower and washbasin cabinet.Solar hot water plus accumulator with electric 150 l.Swimming pool with solar hot water.Outdoor shower with hot waterWater tank of 15,000 liters with pump, for garden or housing.Aluminum exterior carpentry Technal hidden sheet, with Climalit glass and security.Outdoor shutters and mosquito net in rooms.Armored entrance door.Wood interior carpentry.Completely finished garden with mesh red and Alicante gravel red, with programmable drip installed.Access paved with natural stone from the street to the garage and to the house.Stone walls in the whole plot.Terraces with steel and glass railing.Fully fenced plot with access doors with automatic door entry and remote control.Granite staircase with steel railings.Porcelain stoneware tiles.Alarm. 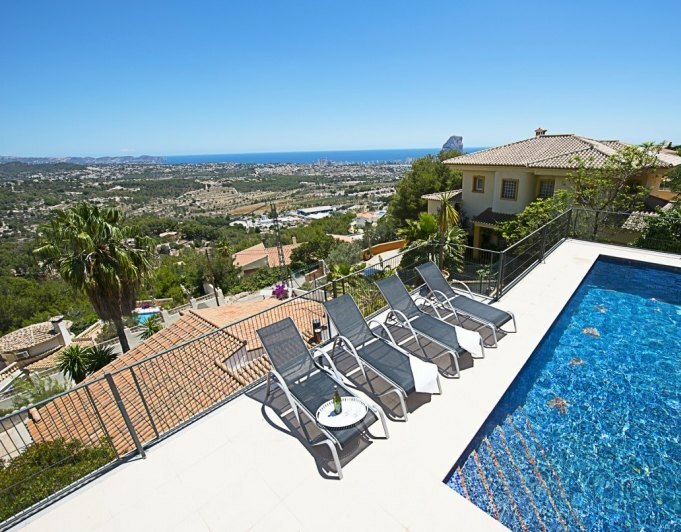 Impressive villa with views to the sea in Calpe. This villa is situated in the area Oltamar.​Access to the plot is through a set of double iron gates which leads us down the drive way either to the front door of the villa where we can accomodate easyly 4 5 cars or down to the integrated garage on the lower level with room for another 4 5 cars, there is a staircase connecting the garage with the living area.​​Accomodation is set all on one level and comprises:Dining room with access to the terrace and the pool. Independent kitchen completely equipped with ceramic hob, dishwasher, oven, microwave, refrigerator with freezer, coffee maker and cookware. 1 guesttoilet with wshbasin. 1 large bedroom with double bed and bathroom in suite with bathtub, shower, wc, and washbasin. 1 bedroom with double bed (2 single beds put together) and bathroom in suite with shower wc and washbasin. 1 large bedroom with double bed and bathroom in suite with shower, wc and sink (in this bedroom there is another room with window and space for an individual bed and 1 room with washingmachine). External: terrace with pool (8x4m) with builtin stairs (access to the pool from the terrace by stairs with a few steps), spacy area to sunbath, external shower, small pergola for to make barbecues. This stunning luxury villa is set on a big privileged plot of land on the sea front with access to the green coast walk and also beach access.Accomodation is set on 3 levels, on the ground floor we find ample covered parking for two cars, big entrance hall, huge living/dining room, open plan kitchen, laundry room, guest cloakroom and one double bedroom with ensuite, all with access to the ample terraces and pool area.On the first floor we have 4 large double bedrooms with ensuite bathrooms, one of them being the big master suite with dressing room and private terrace access.In the basement we have a big gym area, indoor pool, cinema room with bar area, bathroom and plenty of storage.The property boasts underfloor heating, airconditioning hot and cold, security glazing throughout, indoor pool, outdoor pool, gym, covered parking and top location.